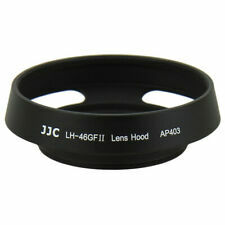 JJC LH-46GFII Lens Hood is designed to prevent unwanted stray light from entering the lens by extending and shading the end of the lens. The non-glare matte finish on the inside further prevents or limits lens flare. This lens hood maximizes the amount of hood coverage for the minimum amount of weight and hood area because of its shape. The main function of the lens hood is to shade the lens from stray light, improving your contrast and image quality. This is a DC-SN 77mm Improved Design Screw Mount Flower Petal Shape Lens Hood. Attach the hood by screwing it on the filter or lens thread. 1 x DC-SN 77mm Improved Flower Petal Shape Lens Hood. Hood Shape: Flower Petal. Suitable Canon EF-M 22mm f/2 STM Pancake Lens. Canon EF-M 22mm f/2 STM (43mm filter thread). Made from high quality aluminium alloy. Material: Aluminium Alloy. This lens hood maximizes the amount of hood coverage for the minimum amount of weight and hood area because of its shape. It will screw into any 34mm Lens or filter. Lens hoods are very useful lens accessories, as they keep stray light away. from the lens surface making sure that images are sharp and contrasty. Olympus M.ZUIKO Digital 17mm f1.8 Lens. It shades the lens from stray light, prevent or limit lens flare, improving your contrast and image quality. Replaces Olympus LH-48B. Compatible with the following Sony NEX E-mount lenses SONY SEL16F28 16mm f/2.8 Wide-Angel Alpha E-Eount lens (SEL16F28). This lens hood maximizes the amount of hood coverage for the minimum amount of weight and hood area because of its shape. It will screw into any 46mm Lens or filter. 30mm Metal Lens Hood, Screw Fit, Anti-Reflective. Made in Japan. Anti-reflective coating to reduce flare. Will screw onto any lens with a 30mm filter thread. Using a lens hood will greatly reduce the risk of flare and low contrast photos. Manufactured in Japan to strict quality standards. For Nikon 10-24mm/17-35mm/18-35mm/12-24mm Lens. This lens hood maximizes the amount of hood coverage for the minimum amount of weight and hood area because of its shape. The main function of the lens hood is to shade the lens from stray light, improving your contrast and image quality. Will not interfere with the use of lens cap or filter. No vignetting will be caused with the hood on. Blocks stray light from entering the lens. Extra protection from accidental impact. We promise to reply in 12 hours and give positive answer. Jupiter-8 1:2 F=5cm, FED Industar-26M 1:2.8 F=5cm, Helios-103 1.8/53mm. Lens hoods are very useful lens accessories, as they keep stray light away. from the lens surface making sure that images are sharp and contrasty. 82mm 3-Stage Collapsible Rubber Hood for lens with 82mm screw thread UK SELLER!! All lenses with 82mm filter thread. Just screw the base of the hood onto your lens 82mm filter thread. The main function of the lens hood is to shade the lens from stray light, improving your contrast and image quality. The main function of the lens hood is to shade the lens from stray light, improving your contrast and image quality. Shades lens from stray light, improving your contrast and image quality. Made of high quality aluminium alloy for extra durability. Elmar and Summaron lenses are shown for illustration! Lens hoods are very useful lens accessories, as they keep stray light away. from the lens surface making sure that images are sharp and contrasty. Wide Angle Lenses with 46mm filter thread. Thread: 46mm. The main function of the lens hood is to shade the lens from stray light, improving your contrast and image quality. Shades lens from stray light, improving your contrast and image quality. Suitable Canon EF-S 24mm f2.8 STM EF 40mm f2.8 STM lens. EF 40mm f/2.8 STM lens (52mm). EF-S 24mm f/2.8 STM lens (52mm). Made from high quality aluminium alloy. Material: Aluminium Alloy. This lens hood maximizes the amount of hood coverage for the minimum amount of weight and hood area because of its shape. The main function of the lens hood is to shade the lens from stray light, improving your contrast and image quality. Shades lens from stray light, improving your contrast and image quality. Thread: 52mm. Compatible Model List : AI-S 50mm f/1.2 (Manual Focus). ♢ Focusing Screens. ▷ Fuel / Oil Hose. Type : Lens Hood. ♢ Lens Cap. ◈ Quick Connect Fittings. ♢ Stainless Steel Braided CPE. ♢ Stainless Steel Braided PTFE. All lenses with 43mm filter thread. Thread: 43mm. Just screw the base of the hood onto your lens 43mm filter thread or onto a filter if fitted. The main function of the lens hood is to shade the lens from stray light, improving your contrast and image quality. JJC LH-ES60 Lens Hood is designed to prevent unwanted stray light from entering the lens by extending and shading the end of the lens. The non-glare matte finish on the inside further prevents or limits lens flare. JJC LH-74B Lens Hood is designed to prevent unwanted stray light from entering the lens by extending and shading the end of the lens. The non-glare matte finish on the inside further prevents or limits lens flare. ProTama 49mm EX-08 Ultra Slim HD MC UV Cut Filter. As you can see the following ProTama EX-08 UV-Cut filter is able to cut off the UV light from the torch. ProTama 49mm EX-08 Ultra Slim HD MC UV Cut Filter x 1. For Panasonic H-FS12060 Lumix G VARIO 12-60mm / F3.5-5.6 Asph. / Power O.I.S. Zoom Lens. Panasonic H-FS12060 Lens Hood. all products are original 100% authentic and never been used unless otherwise stated. 58mm Petal Lens Hood. Universal screw mount: Fits lenses w/58mm filter thread. Why a lens hood?. A lens hood blocks light that your lens shouldn't be receiving. They're particularly useful when shooting against strong sources of light (such as sunshine) which can create flares and decrease image contrast and definition. Not compatible with OLYMPUS M.ZUIKO DIGITAL 14-42mm 1:3.5-5.6 Lens. Lens hood is one of the most important accessories for each lens you own. We promise to reply in 12 hours and give positive answer. All lenses with 46mm filter thread. Thread: 46mm. Just screw the base of the hood onto your lens 46mm filter thread or onto a filter if fitted. The main function of the lens hood is to shade the lens from stray light, improving your contrast and image quality. ZEISS Biotar lens shown for illustration! Lens hoods are very useful lens accessories, as they keep stray light away. from the lens surface making sure that images are sharp and contrasty. Canon EF-S 18-135mm F/3.5-5.6 IS USM. This lens hood maximizes the amount of hood coverage for the minimum amount of weight and hood area because of its shape. The main function of the lens hood is to shade the lens from stray light, improving your contrast and image quality. This Authentic Konica lens hood, screws onto any lens with a 55mm filter thread. Olympus M.ZUIKO DIGITALED 60mm F/2.8 Macro. Fits to the lens We promise to reply in 12 hours and give positive answer. If the product was sent to you in error by our staff, we are responsible for all fee. Carl Zeiss Jena Flektogon 2.8/20mm. Various Canon Lens FD and Nikkor AF-D Lenses. ULTRA-Wide-Angle 67mm Lens Hood. Front threaded and will accept a 52mm clip on cap. Black anodised outside finish with matt anti reflective surface inside. Manufactured using high impact black plastic for extra durability, suitable for Canon EF 24-105mm F/4 L IS USM 24-105 lenses CANON EF 24-105mm F/4 L IS USM 24-105 lens. This lens hood maximizes the amount of hood coverage for the minimum amount of weight and hood area because of its shape. Canon EF 50mm f/1.4 USM. Lens hoods are primarily designed to prevent unwanted stray light from entering the lens by extending and shading the end of the lens. This third party lens hood replaces Canon ES-71 II. The main function of the lens hood is to shade the lens from stray light, improving your contrast and image quality. Shades lens from stray light, improving your contrast and image quality. This lens hood maximizes the amount of hood coverage for the minimum amount of weight and hood area because of its shape. Smc DA 18-55mm F3.5-5.6 AL WR Lens. This lens hood maximizes the amount of hood coverage for the minimum amount of weight and hood area because of its shape. The main function of the lens hood is to shade the lens from stray light, improving your contrast and image quality. Professional quality screw-in rubber lens hood. Wide angle shape to help avoid vignetting on wide angle lenses. Anti-reflective to reduce flare. Will screw onto any lens with a 77mm filter thread. All lenses with 72mm filter thread. Just screw the base of the hood onto your lens 72mm filter thread. 1 x 72mm Screw Mount Flower-Petal type Lens Hood. Hood Shape: Flower Petal. This lens hood maximizes the amount of hood coverage for the minimum amount of weight and hood area because of its shape. The main function of the lens hood is to shade the lens from stray light, improving your contrast and image quality. Normal Angle Lenses with 52mm filter thread. Shades lens from stray light, improving your contrast and image quality. 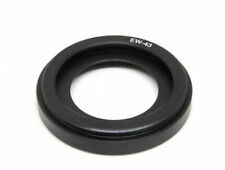 OLYMPUS LENS HOOD for 35ED, 35EC-2, 35ERC, 35RC. ThisLens Hood is designed to fit the OLYMPUS 35ED, 35EC-2, 35ERC, 35RC and also fits the OLYMPUS Trip 35. and also fits the OLYMPUS Trip 35. This Hood is attached to the front of the lens (or filter) by tightening the inner ring with the thumb screw. Reduce lens glare and flare, reflection-free, provides a more moderate amount of light. 1 Piece Silicone Lens Hood. - Material: Silicone. Color may be slightly different since different monitor. - Easy to install, when you install it, you don't need to remove any spare parts.